I consider whatever is offered as my compensation. I do have a call out fee of 10 dollars for San Antonio. Anything outside of San Antonio will be agreed upon before searching. Lawns, Parks, water up to 5 feet. Honestly, pretty much anywhere. Will search for anything made of metal or having metal content lost in the water or on dry land. 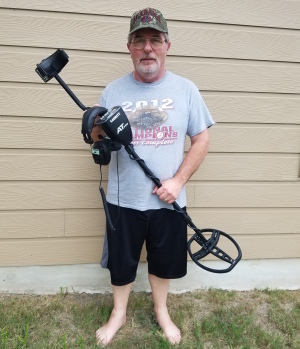 I have been actively metal detecting for the last 3 years. I have gained extensive search and recovery knowledge and techniques during that time. It is a passion of mine to find and recover precious items that people have lost. There is nothing greater than the big smile on someone's face when the have been reunited with what they thought was lost forever. Estatic! So happy to have been reunited with something of great value. The ring meant a lot to me and my boyfriend, it hurt to have lost it. Peace has been regained since finding the ring. Thanks to the ring finders!!!! 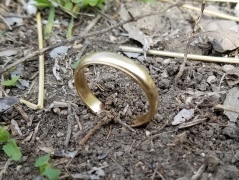 After I accidentally flung my wedding ring over the deck of our house, I spent hours with a friend and a rented metal detector searching with a metal detector for a hopeless recovery. The terrain is unstable and rocky with beautiful (I thought until they ate my ring) blooming native grasses. 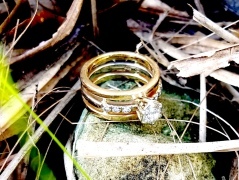 My husband miraculously discovered The Ring Finders website. When Mike answered my call Friday evening I could hear that he was in the middle of a joyous occasion, which was his daughter’s 17th birthday party. Asking him to return my call, he insisted that this was important and he would be at our house, which is an hour and a half away, by 7:30 Saturday morning. His comforting, caring demeanor gave us profound hope. Meeting someone like Mike, who is so confident, understanding, experienced and determined, erases all of the painful memories of losing something that is irreplaceable.